The MNIST dataset provides images of handwritten digits of 10 classes (0-9) and suits the task of simple image classification. The minimal MNIST arff file can be found in the datasets/nominal directory of the WekaDeeplearning4j package. This arff file lists all images in datasets/nominal/mnist-minimal and annotates their path with their class label. Important note: The arff dataset contains two features, the first one being the filename and the second one being the class. 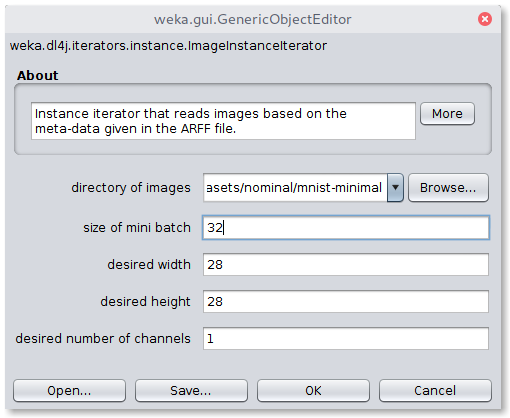 Therefore it is necessary to define an ImageDataSetIterator which uses these filenames in the directory given by the option -imagesLocation. 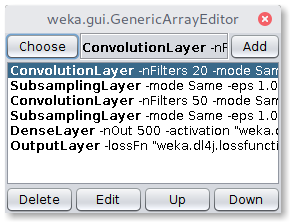 To correctly load the images it is further necessary to select the Image-Instance-Iterator as instance iterator and point it to the MNIST directory that contains the actual image files ($WEKA_HOME/packages/wekaDeeplearning4j/datasets/nominal/mnist-minimal/). Select LeNet from the zooModel option as network architecture. A holdout evaluation strategy has to be selected in the Test options box via Percentage split, which can be set to 66% for a 2/3 - 1/3 split. The classifier training is now ready to be started with the Start button. 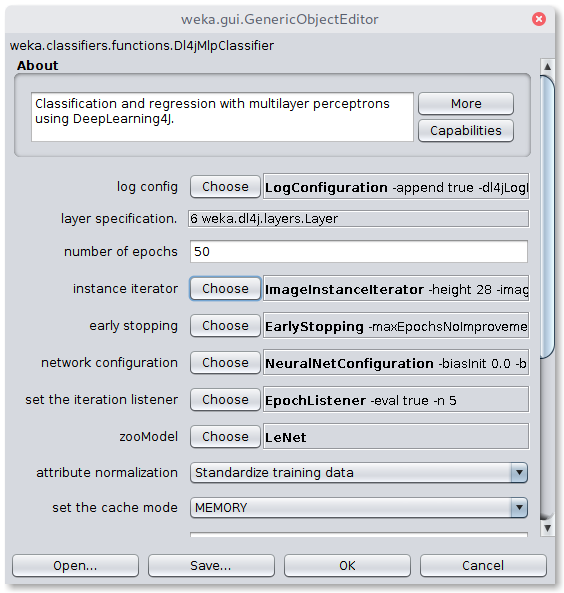 The resulting classifier evaluation can be examined in the Classifier output box. Here, an evaluation summary is shown for the training and testing split. The above setup, trained for 50 epochs with a batch size of 256 produces a classification accuracy of 93.71% on the test data after training on the smaller sampled MNIST dataset and a score of 98.57% after training on the full MNIST dataset. Table 1: Results for training time and classification accuracy after 50 epochs for both the sampled and the full MNIST training dataset using the LeNet architecture. Experiments were run on a NVIDIA TITAN X Pascal GPU.